Appallingly, the University of California system has just prohibited its employees from using AirBnB (and other peer-to-peer services) for business-related travel [link: Inside Higher Ed]. I’ve become a big fan of AirBnB [wikipedia]. For those unaware of it, it links people with rooms or apartments or houses to briefly rent out with people looking for a place to stay. It’s a great example of the internet facilitating both interaction and commerce, linking the excess supply (rooms) with demand (travelers) without the middlemen of hotels. My family and I have used AirBnB for personal travel, but more often than this, I’ve used it for lodging during conferences. I’ve done this three times so far, and have each time been happy with it. I stayed a night in San Francisco during a computational image analysis meeting, for example, in an apartment in North Beach, walking to the meeting and wandering through one of my favorite areas. The cost: $84. Try finding a non-lethal hotel in San Francisco for that amount! It’s true that one sacrifices convenience a bit for AirBnB. It takes some effort to coordinate handoffs of keys, etc., and it’s not for everyone, or every occasion, but it can work well. But: who cares if I dislike hotels, can put up with some risk, and like staying in interesting neighborhoods? The more important thing is that it saves money. Money for these meetings comes from my research grants. I and the people funding these grants (presumably) would prefer to spend this as much as possible on doing science; the hundreds of dollars I’ve saved by using AirBnB are hundreds of dollars that can go towards lab supplies, student salaries, equipment, etc., something that the administrators at the University of California should be encouraging, not shutting down. The decree comes from UC’s “Office of Risk Services,” which vaguely cites “insurance concerns.” The least risky action, of course, is to not travel and not work at all. Or better yet: all business-related travel could require a paid chaperone, looking out for pickpockets, oncoming traffic, and other dangers, further minimizing risk at the cost of wasted research funds. After all, the administration doesn’t benefit from its researchers saving money. 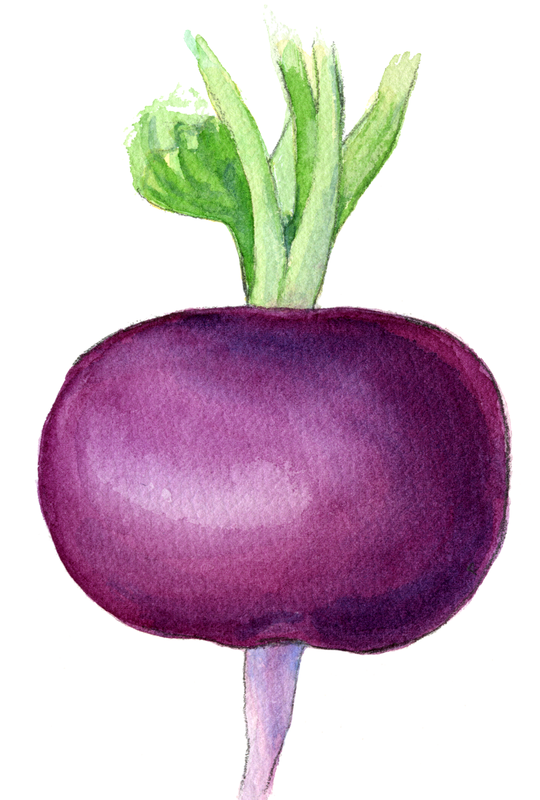 This is a short, quick post, so I included a just a small picture at the top: an amethyst radish, which I painted for a poster for a friend.